Double Gauze fabric is kind of new out there. It’s light, airy and perfect for swaddling babies in the summer. 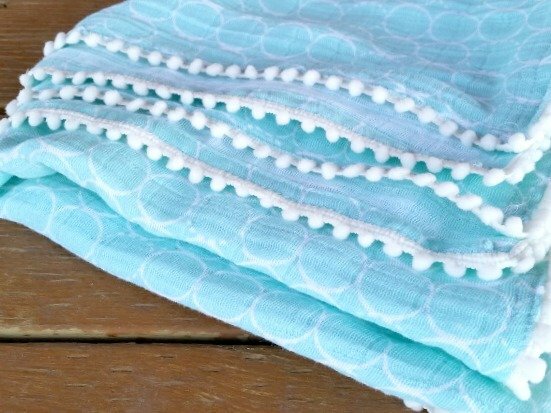 This baby blanket tutorial with a video will show you how to do a double folded hem or binding….and there are pom poms on the edge! Don’t be afraid of the pom poms. 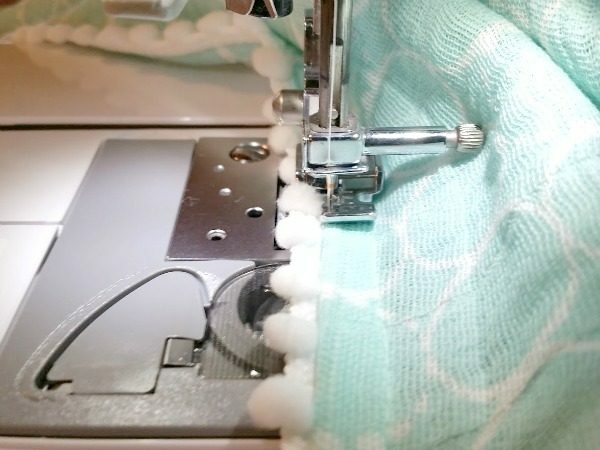 Use a zipper foot to help stitch them on, but I’m telling you they are worth the extra fuss. 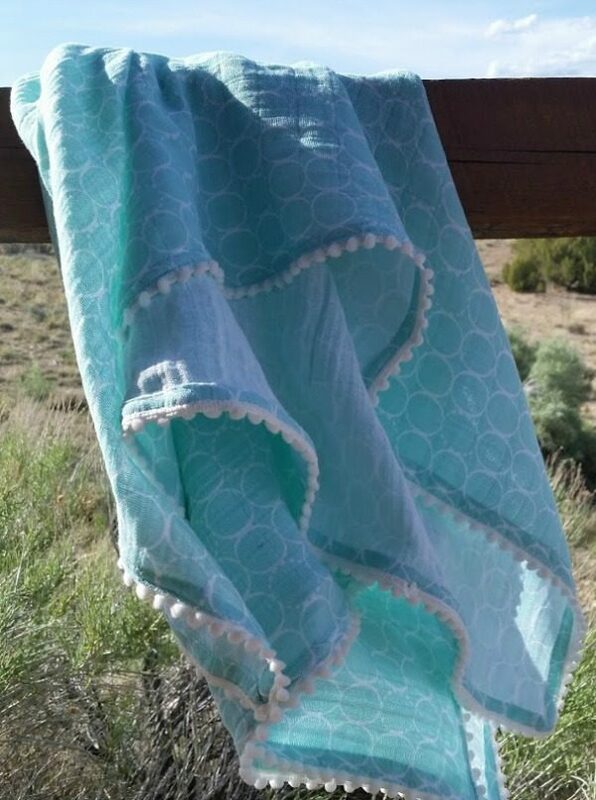 So cute and a great way to dress up a simple baby blanket or even quilt. 1- Cut your double gauze fabric so it’s square. The piece I bought was 60 inches wide. I cut it square to the 45. There will be leftovers….watch for a tutorial on what to do with it! *You’ll be stitching on top of the hem, right along the edge with the pom pom trim tucked under. Leave your needle in the down position and check often the placement so you don’t skip the trim. 1- Lay the mini pom pom on top of the hem and stitch to secure. 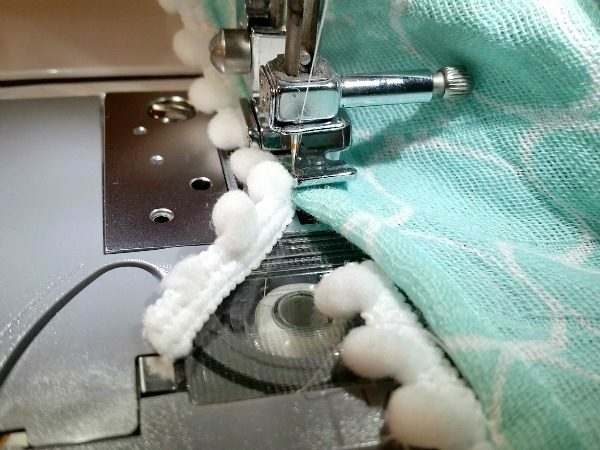 Use a zipper foot to make it easier to get around the pom poms. 2- At the corner, leave the needle in the down position, pivot the pom pom around the corner and begin again. 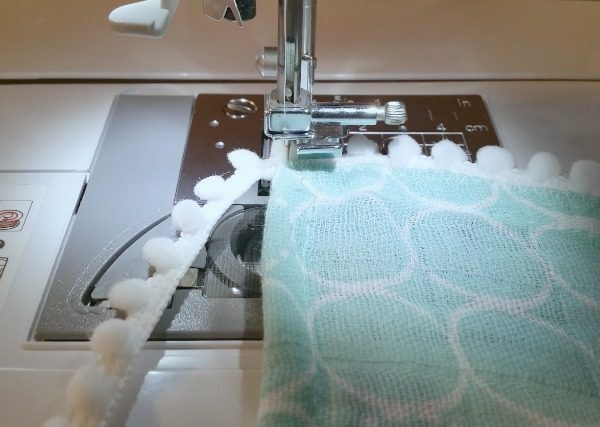 Watch for the tutorial on making a baby burp cloth using the extra fabric! Clickety click here for more binding tutorials, baby blankets and baby quilts. Have you stitched with double gauze yet? Like it? it is adorable fabric! I am in love with it. Thanks for stopping by. want to do one for a Feb. baby; double the gauze with pom poms between? 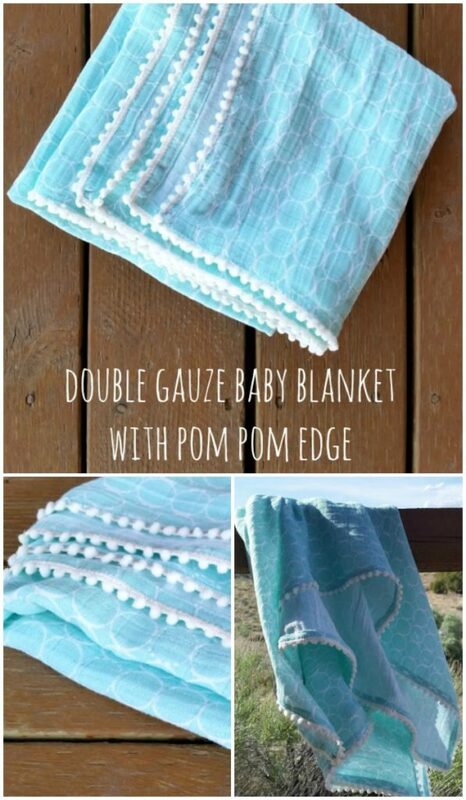 want to do one for a Feb. baby; double the gauze with pom poms between? would I need to tie? does gauze slip when doubled? Holly- it does a little, but it’s not bad. You could do some large, straight line quilting if it was giving you issues. dumb question, but are the poms on that trim really secure? I don’t want to worry about the baby recipient managing to eat one. Gosh. I ordered a (supposedly) double gauze from a reputable online fabric store, and it’s almost impossible to work with! The only edge that’s not warping and tweaking is the selvedge and there’s only one of those. I tried spray starching and that only partially helped. How thick should a double gauze be? Hi and thank you very much for the great tutorial! I am confused with how much material I will need for this project. You say you the material was 60″ but you cut it down to 45″ but how many yards did you get? Maybe this is a dumb question but I am confused. Thank you! I think what I did was by just more than a yard- so maybe matched that 45″ or you could even match the 60″ and make it square. 60″ is a big large for a tiny baby, so buying it to the 45″ length and then cutting it to the 45″ is perfect. The extra that is cut off you can use for extra burps or cloths. Does that make sense? hope that helps! 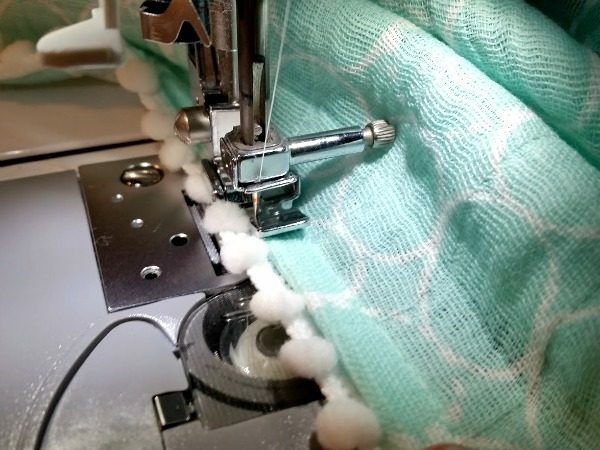 I love the look of this blanket and your video makes it look so DOABLE! where did you order these pom poms from/what size are they? Beautiful! Where did you get your fabric from?